....an SAS trip to remember!! We’ve done some pretty imaginative events with the Swindon Association of Snails, but ‘Raid 5 Capitals’ during the first 10 days of June 2012 was our most ambitious yet. “So, how did it come about?” we were often asked during the event. 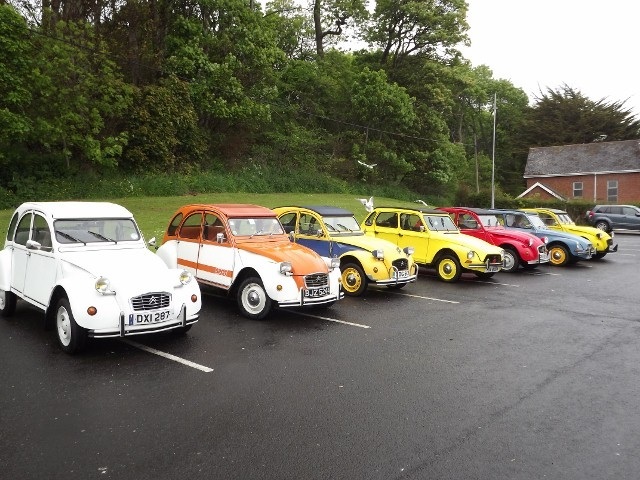 Well, there was probably a bit of alcohol involved one night followed by one of those ‘what I’d really like to do with a 2CV’ moments. What we were looking for was a road trip that balanced plenty of miles with a rest day every other day somewhere interesting and including some truly exceptional roads. What follows is a brief piece telling what we got up to, the lovely people we met and how we had so much fun from our little cars. You can do all the planning in the world, but eventually the time comes when you simply have to start a road trip. That time came for us early today, when we said goodbye to our little house & 2 cats then headed a mile up the road to our rendezvous point at the Divine Cafe where our good friend & owner Mark had opened up early ready to get us on our way. With some trepidation we pulled in, delighted to see all our cars there already waiting for us. Oh, how good when a plan comes together! 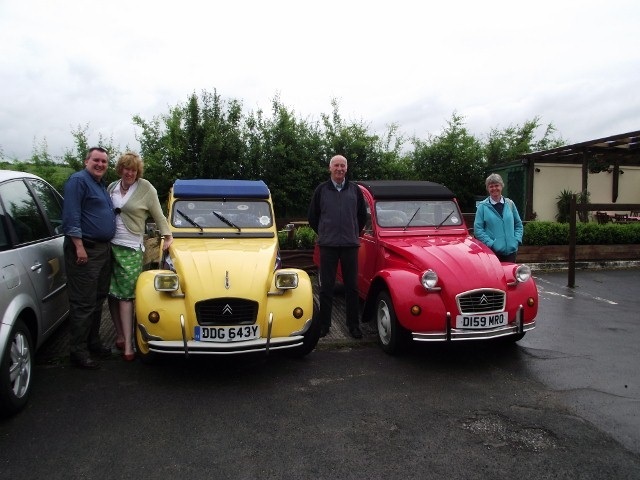 Our group consisted of: Jim & Marg (Lyneham, red Special), John & Carol (Chippenham, blue Dyane), Ian & Jenny (Hereford, red & white Dolly), Kev & Marie (West Brom, yellow Dyane). Breakfasted, we hit the road, settling into a nice relaxed cruise with all cars keeping together along the A4 and onto our first capital – London. 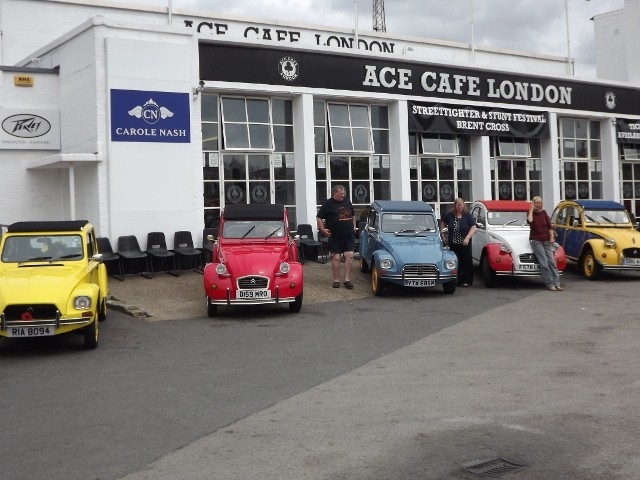 Now, here we cheated just a teeny bit as time didn’t allow for a visit into central London, so we headed to that Mecca for motoring enthusiasts The Ace Cafe where we arrived just in time for lunch. This was the day I’d been least looking forward too – just short of 300 miles heading North on a summer Saturday with all the other leisure traffic. With Jim & Marg leading we skirted Nottingham and headed through Sherwood Forest before joining the M1 for the boring part. The motorway was choked solid and we lost plenty of time by having the traffic grind to a halt every few miles for absolutely no reason. During the afternoon things got so much better though when we joined the A68, a road I was really looking forward to driving. I’d gone North through the Cheviot Hills on the A68 before, but I’d forgotten just quite how stunning the scenery was despite the weather turning a bit rough. We reached a high at Carter Bar by stopping at the Scottish border and celebrating our second country in two days. 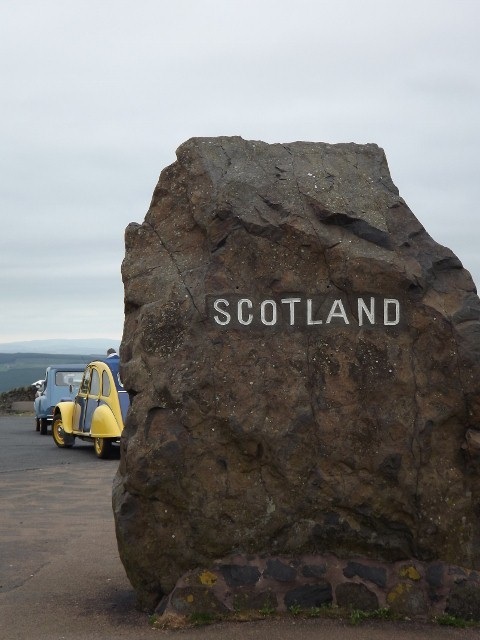 Carrying further on, we reached our overnight stop just South of Edinburgh, tired, but not exhausted by any means – what wonderful little cars we have! We spent a lovely day at leisure in Edinburgh ‘the Auld Reekie’, seeing the best of it from a sightseeing bus. Roadworks, mainly down to the flawed tramways network, caused absolute chaos to all motorists and the city centre was pretty much gridlocked to the extent that our hour long bus tour took nearly two. I’d been looking forward to today’s drive too as it took us from Edinburgh down towards Glasgow (keeping off the motorway was best) and then down to Ayr. South from Ayr we followed the coast in glorious sunshine with the roof rolled back and the views across the Irish Sea were magnificent. Arriving at Cairnryan I was please to see the ferry to Belfast was a decent sized one (I must rate amongst the world’s worst seafarers! ), we were soon onboard and heading towards our third country & capital city. 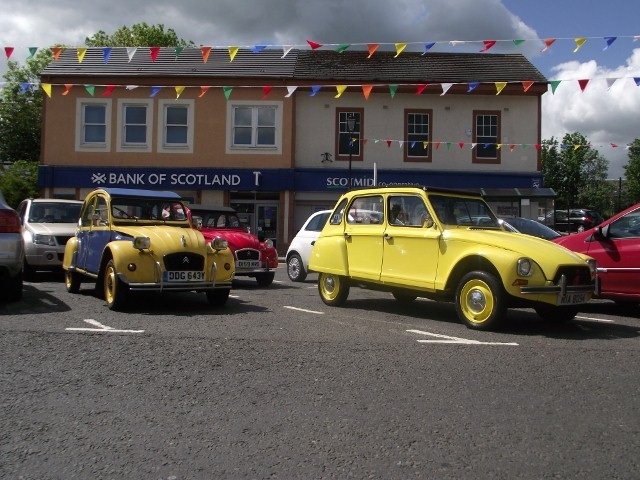 Today summed up the friendship we met absolutely everywhere along our journey – other motorists & pedestrians alike stopped us to take photos, chat and find out just exactly what we were up to with our ‘strange little cars’! A really good example of this was at a teeny town on the road down to Ayr little bigger than a village, we’d called in for a late breakfast and quite by chance met a chap who was the Chairman of the Scottish Riley car club – even better, in his shed at home he had a grey/grey Charleston just waiting for a new lease of life. A smooth crossing over, we arrived in Belfast. Northern Ireland was a new territory for me and I guess I knew little about it other than ‘The Troubles’. What I did know about Belfast however, was the connection to Titanic, and as a huge Titanic enthusiast (yes, I know I’ve told you I hate sailing!) and so I’d booked us into a hotel within a stone’s throw of where the tragic liner was built. Imagine my delight on opening the curtains in our hotel room and looking directly out at the twin giant yellow cranes (Samson & Goliath) under which the great ship was constructed. The best way to see a new city in my opinion is by taking a sightseeing bus. 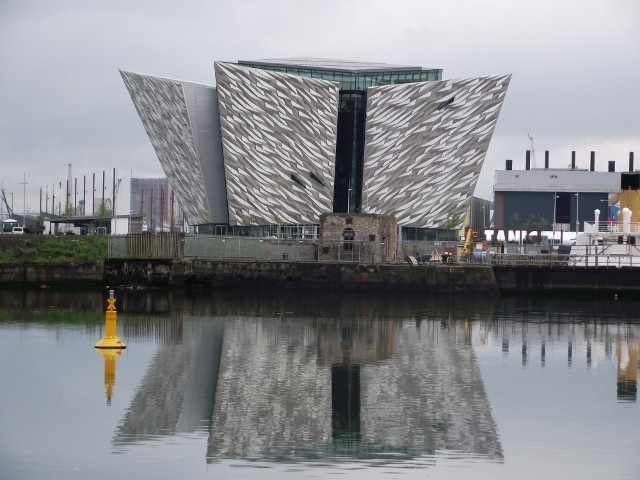 What a city of two parts though – we started off seeing the ‘touristy’ side of Belfast with the City, the Titanic Quarter celebrating the building of the great liner before heading out to see Stormont, home of the Northern Irish government. From there we came down to earth with a bit of a bump by visiting both sides of ‘The Troubles’ in the form of the Falls Rd & Shankhill Rd areas – flags flying, memorials on street corners and those huge murals reminding us what happened there. That was a morning of reality for us all, but we all left truly feeling what a fabulous city Belfast is. If you haven’t visited, put it on your ‘must do’ list. 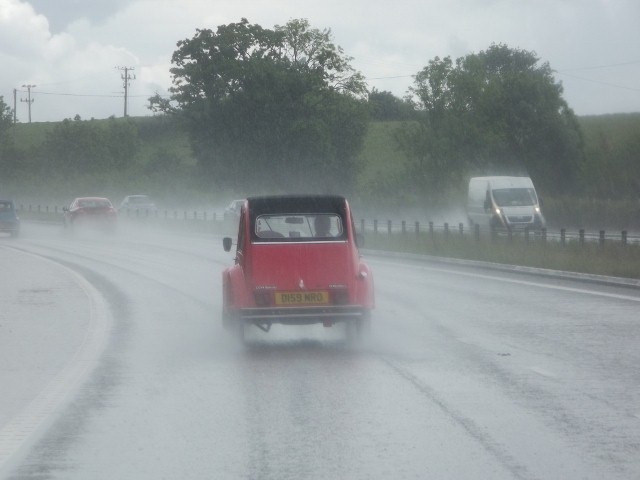 For the afternoon, Roger and his friends had organised a special trip for us, although the weather was getting very wet and Alfonse was starting to leak! 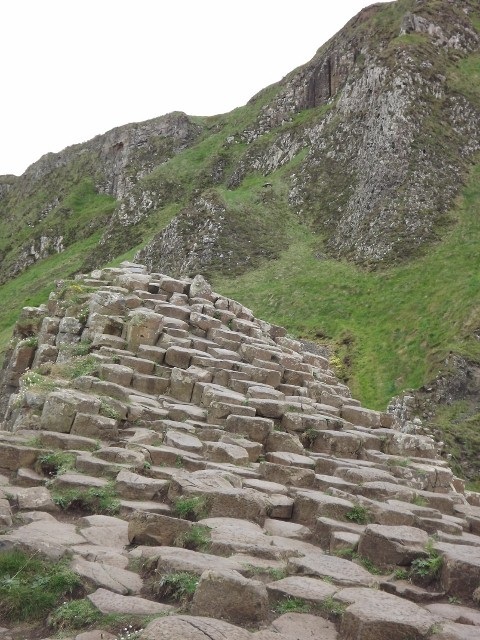 Off we set heading North up the absolutely beautiful Antrim coast and stopping at the famous Giant’s Causeway. What a super place! Early evening we headed back into Belfast having done 100 miles touring the coastline to the North, and making a vow to return here next year for a proper tour. A huge ‘thank you’ to the members of the NITS who put themselves out so much for us on this day. Being a Titanic enthusiast, I simply couldn’t leave Belfast without physically touching bits of the Harland & Wolf shipyard where the great liner was built and the new Titanic exhibition was great. After lunch, just as the weather took a turn for the worse, we headed South out of Belfast on our way to Dublin, our 4th Capital & Country. Roger led, but couldn’t believe his car could drive so slowly – we ‘convoy cruise’ about 50ish on this tour but Roger is far more comfortable a wedge faster! At least Rog now understands how I get such a fantastic fuel consumption! At home, Helly & I live in ‘Stone Age’ Wiltshire right on the doorstep of Avebury and not far from Stonehenge, so ancient history is important to us. For that reason we broke our journey South at Newgrange, a massive burial chamber some 5000 years old and beautifully preserved. Well worth a visit, even in absolutely torrential rain! Arriving in Dublin we met up with another well known Irish Citroen character, the lovely Frank, who kindly took us all out for the evening along the coast. Beautiful food, a drop of Guinness and many funny stories later, I discovered that our friend Roger was the cause of some heartache in my life last year! 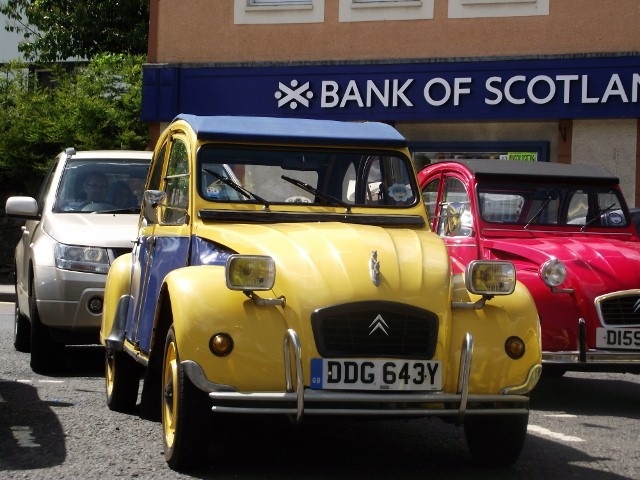 The story involves Ebay, and a beautiful one owner, very low mileage Citroen Visa in beige – I had been the winning bidder throughout the period until literally the last couple of seconds, in fact I was so confident of winning I’d arranged insurance & transport! Well, I lost out at the very last second, and the winner was sat there at the same table as me! No hard feelings Roger, you’re now a good friend! Our full day in Dublin dawned wet, very wet in fact – and what better way to see the City than from an open top bus! Well, it was a no-brainer really and we were soon tucked up in the dry at the Guinness Brewery where we spent a happy afternoon learning about the manufacturing process and sampling some of the product. Overnight the weather was pretty bad and I didn’t get much sleep worrying about our ferry crossing to Holyhead the following day. Up bright and early for our crossing to Wales, which went surprisingly well (although 12 hrs later a storm developed that did terrible damage to the Welsh coast) and at lunchtime we came ashore into Wales, our 5th & final Country. Here we met up with Mike & Sarah Beattie who were to travel with us on this final leg and we were soon crossing Anglesey and heading for a photo stop at a railway station with a very long name – Llanfairpwllgwyngyllgogerychwyrndrobwllllantysiliogogogoch. The village has, as you now realise, the longest place name in Europe. From there, we crossed into North Wales properly over Thomas Telford’s Menai Suspension bridge of 1826 and headed to Caernarvon to look at the Castle and get a little lunch. By now the storm had hit, blowing a gale and really lashing down with rain to the extent that we were warned against using the Llanberis Pass as it was dangerous. On we went via a safer route to Bala for our overnight stop, this being in a peaceful retreat right on the edge of Lake Bala. Just a shame it was raining so hard! The day dawned very wet indeed and tv reports were all about torrential rain & flooding around North Wales leading to damaged property and people being airlifted to safety. This we didn’t need to hear, and a careful study of the map was taken to re-route us over safer ground. We were waiting for our friend Simon Childs to join us for the run South, but heard from him that he was stuck in floodwater near Aberystwith and awaiting rescue. And so to our final day – the end of our road trip and the end of our little adventure, but first we needed to do an Open Top bus tour of Cardiff! The weather was pretty good so we were able to ride upstairs and enjoy this interesting city before setting off East on our final leg. So, what of our road trip? Well, nothing broke, every car made it safely back, the only times we had to get the toolbox out were to change a brake light bulb on one car and to adjust a clutch on another. 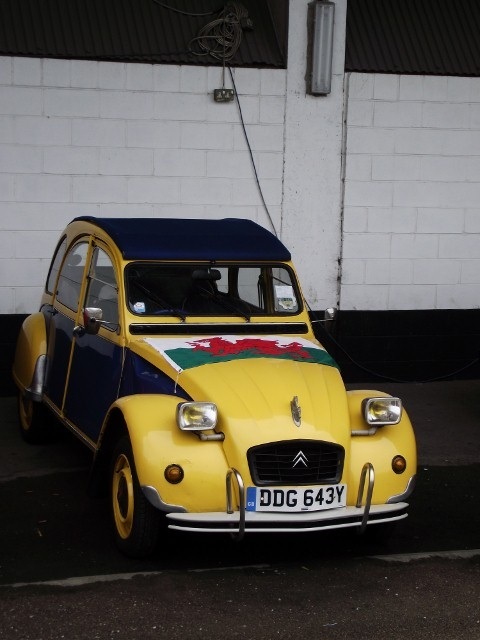 Our car, M Alfonse, knocked up 1321 miles, was 100% faultless (if a little leaky!! ), consumed a negligible amount of oil, averaged 56.2 mpg overall and provided us with more smiles per mile than you could ever imagine. If you ever fancy a long road trip, but don’t have the confidence, take our advice and simply do it! Best bits? So many really – but I have to make a special mention of: Roads (A68 through the Cheviot Hills, the coast road from Ayr heading South, the high road across the Brecon Beacons), Places (Belfast, Newgrange in the torrential rain, Mid Wales), People (absolutely everyone, not just those taking part but also the many people we bumped into along the way). Would I do it again? You bet! So where next? Definitely back to Northern Ireland next year, and for 2014 I was already planning ‘Raid D Day’, another ambitious trip involving some detailed exploration of the Normandy Beaches.